Introduction: Since their reincarnation in 2008, Phenix Rods has been busy re-inventing their product line searching for their niche in the very competitive and over saturated bass rod market. But bass fishing is certainly not the only gamefish for which Phenix makes product. Along with an array of saltwater rods, this company has been growing in popularity amongst trout fishing aficionados. 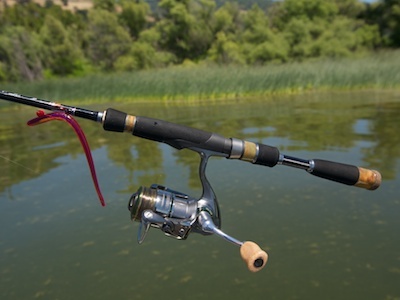 Today, we take a look at Phenix's top end offering in their beautiful trout series of rods. Introducing the Phenix Iron Feather IF722-2. Lure Wt. 1/16 - 3/8oz. Impressions: The Iron Feather IF722-2 is a 7’2” stick that breaks down to two pieces for ease of transport to your favorite trout hole. 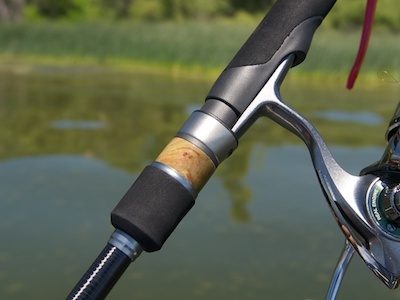 The handle features an eva foam grip with burl wood inlays all built around a standard Fuji reel seat. Of course, the unique aspect of this rod is its very lithe tip that can be bent all the way around to touch the blank. This is achieved by using parallel fibers only with no cross weave support in the tip. It’s a unique feature to say the least but how does this translate to an on the water benefit? 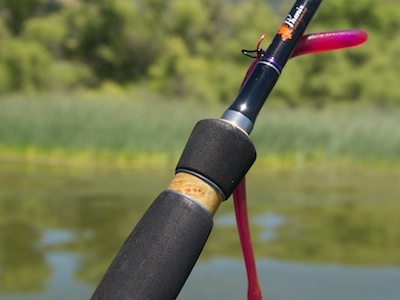 Introducing Phenix's Iron Feather UL Spinning Rod. Field Tests: Only one way to find out of course and that's to get this stick out on the water. Trout fishing opportunities in the San Francisco Bay Area have grown fewer and further between given more restrictive trout planting policies. In order to get to popular and successful trout fishing destinations, one now has to plan well in advance and make an event out of it. The opportunities of going to local, urban and suburban ponds, setting up a few lawn chairs, and sharing a fishing picnic with the family for a couple of hours are just tougher to come by. The IF722-2 is a 2 piece stick. 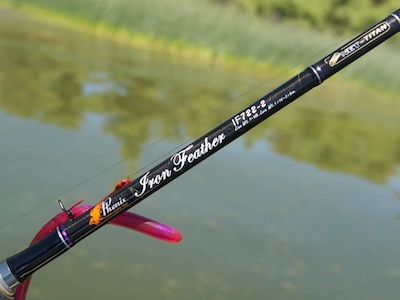 As a result, I used the Iron Feather IF722-2 as an ultra-light alternative on several bass fishing outings so I could get an idea as to how the rod handled. Not exactly ideal, but certainly sufficient with the added benefit I got to use the rod right away rather than wait for an infrequent trout trip to land on the TT testing agenda. Phenix pulls out all the stops in the detailing of this rod's handle assembly. I paired the IF722-2 with my Daiwa Exist Native Custom 1003 spinning reel spooled with five pound Sunline Shooter Metan Invisible fluorocarbon for a super premium and Enthusiast worthy combo, but also fished it with a Daiwa Certate Finesse 2004. The burl wood inlays make for a very majestic looking trout stick. Casting: I've had sitting in my terminal tackle box, some flat sided wacky heads by Gamakatsu for quite some time. I can't even recall what the weight of these heads are any longer, but I know they're really light (on the scale back at the lab, it was revealed these were 1/32 oz heads). When I pulled my IF722-2 and Exist Native Custom combo out of the rod locker on a trip to Clear Lake, and had to decide what to put on this ultra light combo, these wacky heads immediately came to mind. 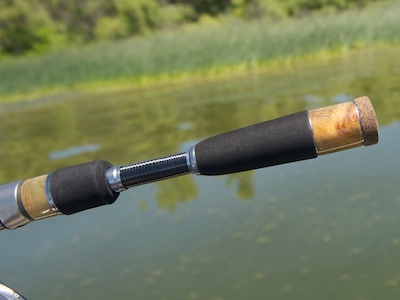 But of course, we tested the Iron Feather as a bass finesse stick instead. I tied the Gammy Wacky Head on and pulled out a four inch, straight tail Roboworm in Morning Dawn, hooked this plastic worm in the middle and prepped for a cast. All I really wanted was to get a feel for the rod and its casting ability. The rod's reel seat locks in from the bottom. 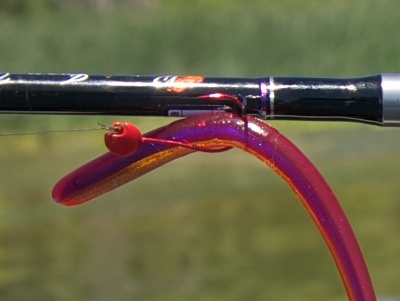 Needless to say, with its super lithe tip, the IF722-2 loads super easy, almost too easy, and could cast the wacky bass rig with very little effort. In just a few short casts, it was quite apparent this stick, together with maybe three pound test line would be incredible for casting little trout spinners in a stream up in the Sierras. 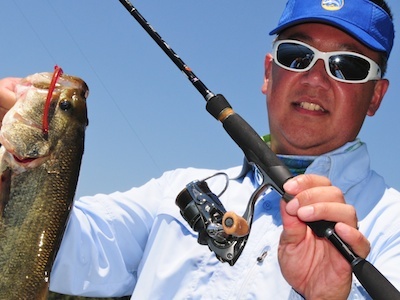 Daiwa's Exist Native Custom makes an excellent match for this rod.